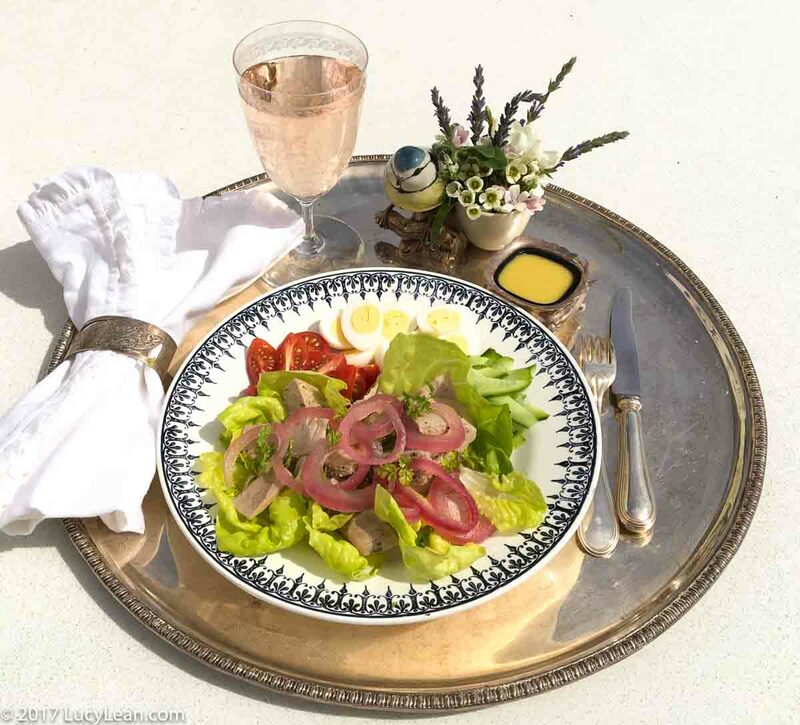 Salade Niçoise is one of my husband’s favorite things to have for lunch – if we are out at a restaurant and this is on the menu then he will choose this almost every time, usually accompanied by a glass of chilled rosé. This year we are celebrating 21 years together – holy cow where did all that time go? This salad comes from one of the places in the world we love the most – it’s where we met, where we chose to spend our summer and where one day I hope to live – Provence. With a classic like Niçoise there’s always debate as to what must be in it to make it a Salade Niçoise – I always thought tuna, eggs, haricot vert, new potatoes, tomatoes, black olives and red onion. However, sometimes even tuna isn’t a part of it – Escoffier didn’t include tuna or eggs – I’m shocked. 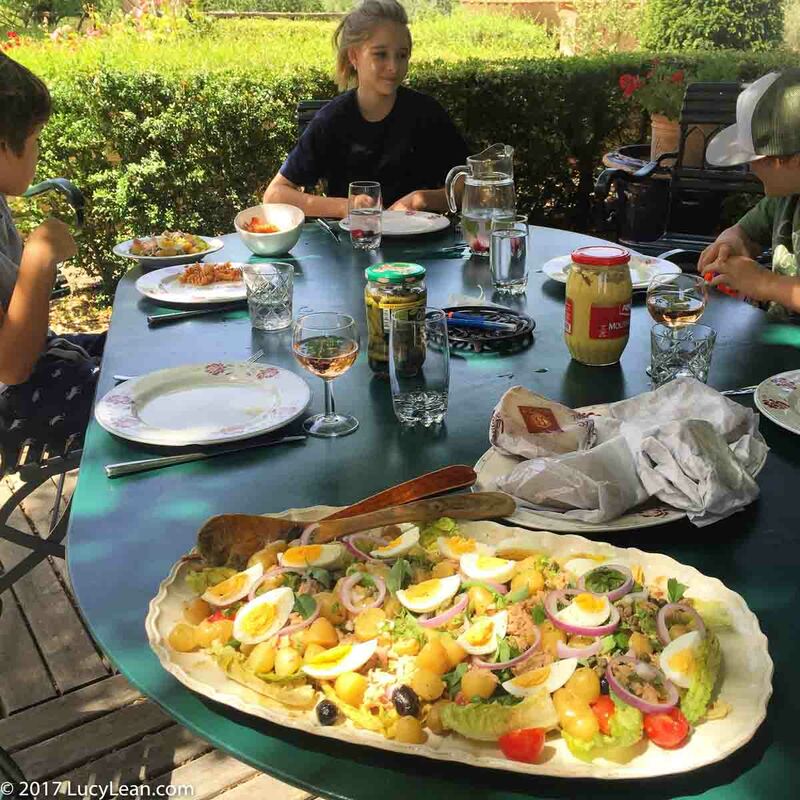 One year in Provence we were cleaning out the refrigerator at the end of the trip and Triona made a variation of a Niçoise with tuna, eggs, olives, potatoes, dill and a very mustardy dressing – no tomatoes, no lettuce, no beans to be had. Why is it classic recipes cause such intense debate? If tuna is to be included then a traditionalist would insist on Mediteranean tuna cured in olive oil from a can or jar – none of your fancyschmancy seared fresh tuna. 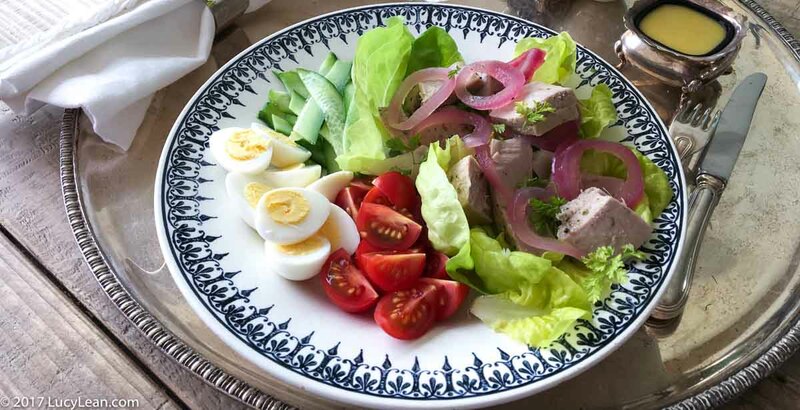 For my Lean Luxury Salade Niçoise I have used tuna poached in olive oil, bibb lettuce, tomatoes, cucumber (I didn’t have french beans so I cut them in long batons), olives and quails eggs and I skipped the potatoes. I also have a hard time with raw onion in a salad so I topped it with pink pickled onions. If you don’t have time to poach the tuna use a good quality canned or jarred variety. For a quick and easy lunch I often open a can of tuna fish in olive oil and add cucumbers, avocado, lettuce, tomatoes – whatever I can find in the fridge and toss it all together in a lemon/mustard dressing for a quick and satisfying Lean Luncheon. The important point to make is if you don’t have egg don’t fret it. Position the rack to the middle of the oven allowing enough space for the Le Creuset and preheat the oven to 350 F.
Season the tuna with salt and pepper and set the aside to come to room temperature whilst you prepare the poaching ingredients. Put the lemon peels and sliced lemons into a large ovenproof saucepan, I use my Le Creuset. 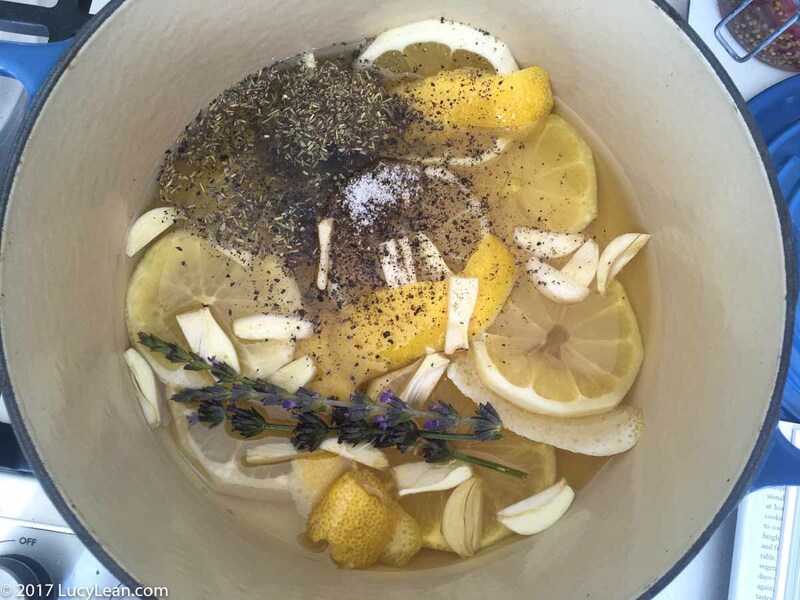 Add the olive oil, remaining salt, pepper, vinegar, lavender, garlic and herbs de provence. Heat the oil over high heat until it begins to bubble around the edges. 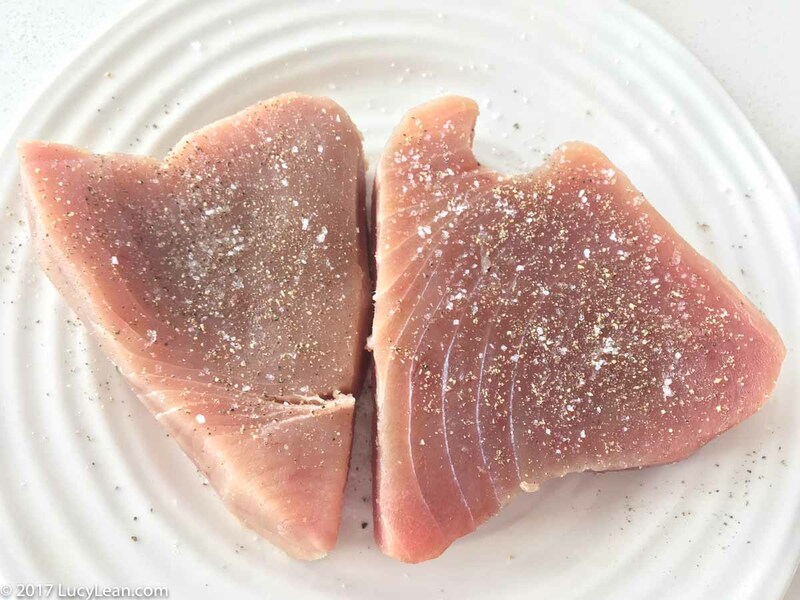 Turn the heat off and use a slotted spoon to carefully place the albacore steaks in the oil without the oil splattering. Cover the pan with lid and aluminum foil, and put in the preheated oven for 10 minutes. Remove the pan from the oven, remove the lid or foil and let the fish cool to room temperature in the oil. Meanwhile, set a colander over a large bowl. Pour the contents of the pan into the colander. Reserve the oil for another use or to store leftover tuna. Arrange all the ingredients (or a mix of what you have in the fridge/pantry) on the plate – serve the salad dressing on the side. Imagine you are sitting outside on the terrace, enjoying the salad with a glass of chilled Provence rosé and a warm breeze carries the scent of lavender from the field. Life moves at a slower pace and everyone is happy.